The weather was perfect for the latest effort to get the churchyard into good fettle. 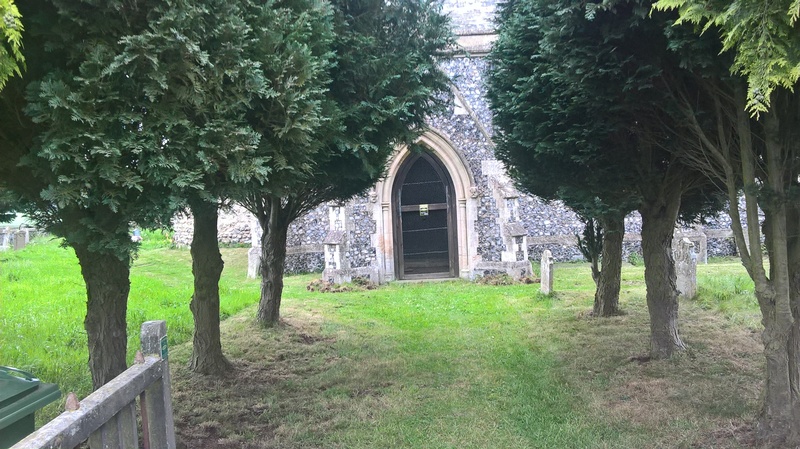 Having cut the grass a few days before, just before the rain, last Saturday saw half a dozen keen gardeners tackling the overgrown drainage channels surrounding the church walls. These are designed to keep water away from the walls and so reduce rising damp, but over the years the channels of cobbles have become over grown with grass and weeds- and the stones just under the surface make for a difficult mowing experience! Well we managed to get about half of the walls cleared of growth, and in due course we’ll need to remove the soil from amongst the stones, but for now that can wait, so hopefully we cna finish the job in the autumn, when it will also be time for the next ‘Haveringland Rake Off’ which hopefully will once again see a large group turning out, especially with the promise of more cake! The Rogation Service held the following day was a lovely event with the congregation giving thanks for all things natural, and especially seeds sown at this time of year. We even held part of the service in the open air, where we spent a few moments appreciating the beautiful place we live in…the barley starting to push up, the buzzards screeching over head, trees coming into leaf and the churchyard starting to resemble a managed conservation area. It was also great seeing some people new to the church, including a couple from Stratton Strawless who had heard about the event via ‘Nextdoor’.